YEARBOOKS: You are still able to order yearbooks online. We have a lot of great events happening in September. Be sure to add these dates to your calendar so you don't miss a thing! Check out the B-Fest events below and stop in! All events are free! 1PM - "B-In The Know" Workshop. Readers will B In the Know at 1 p.m. with teen trivia, created by Penguin Random House, that’ll put your YA street cred to the test. 2PM - "B-Super" Workshop. Calling all comics fans: B Super at 2 p.m.! We’ll be celebrating iconic DC Comics superheroes and heroines, including Batman and Wonder Woman. Don’t miss trivia, mad libs, book excerpts from Leigh Bardugo’s Wonder Woman: Warbringer and Marie Lu’s Batman: Nightwalker, and a giveaway of two copies of Batman per participating store. And remember to wear your superheroic best for our costume contest! Joining us for this workshop will be author Heather Maclean - Author. 3PM - "B-Part of the Fun" Workshop. B Part of the Fun at 3 p.m., when we’ll be celebrating your favorite teen series with games, trivia, scavenger hunts, and more. Joining us for this workshop will be authorsErica M. Chapman and Heather Smith Meloche. This workshop will teach you all about the self-publishing world. Learn about writing, NOOK Press, print-on-demand books, and more! Join us and authors Marsha Thompson, CK Brooke and Mackenzie Flohr - Writer. Aspiring writers will want to B Creative at 5 p.m., with story development workshops created by Barnes & Noble’s NOOK and Adaptive Studios. Joining us for this workshop will be authorsAli Novak, Barbara Rebbeck, Erica Chapman, and Kristin Lenz. This awesome panel of authors will be one you won't want to miss! We will be asking them "no filter" questions and having a blast! Nothing is off limits!!!!! Plus, lots of giveaways! Joining us for this panel will be authors Ali Novak, Darcy Woods, Erica Chapman, Barbara Rebbeck, Mackenzie Flohr, Marsha Thompson, Kristin Lenz, Rebekah Purdy, Heather Meloche, CK Brooke, and Heather Maclean. Marsha Thompson is the author of Spoilers: Rise and Fall. This is going to a fun-filled day of writing, reading, and bookish fun. Be sure to stop on by and enjoy learning from local authors. If you can't make the event and still want to help support Reuther, the online portion of the fair runs until September 29. Use this voucher number 12221925 ​at check out. Contact Mrs. Mainero if you have any questions ! Thursday, September 28, 2017, 6th grade at Reuther Middle School will see a presentation on two programs to protect children across the state. The Michigan Cyber Safety Initiative (CSI) is a national, award – winning program and has been presented to over one million students across the state. It teaches children the importance of being safe, making smart decisions, and protecting themselves and others while online. Also, the student safety hotline, OK2SAY, is a confidential way to file reports on potential harm or criminal activity that is involving students, school employees and schools. Tips can be submitted 24/7 via telephone, text message, email, mobile app, or the OK2SAY website. The students will get an in-depth explanation of OK2SAY on how it works, what types of incidents they can report, how to submit a tip, and what will happen with the tip. You can access the program videos, handouts, and information are available on the Michigan CSI website at www.mi.gov/csi If you choose to opt your child out of this presentation, please complete opt. out form and return to the school. If you have any questions or concerns please contact Eric Williams, Assistant Principal at (248) 726-4700. HOMEWORK HELP begins on October 2nd! Homework Help will take place on Mondays and Wednesday from 2:30 p.m. to 3:30 p.m. in Room 124. Scholarships may be available. Contact the Enrichment Department at (248)726-3165 immediately for details. See the attached flyer for class and registration information. 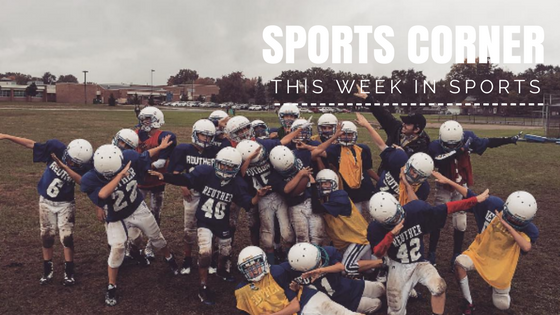 Submit your sports photos to Mrs. Mainero to see them featured on the CN Weekly. Oakland Schools, in partnership with the Oakland Parent Engagement Network, is hosting a free learning event for parents on Saturday, October 14th. Click here for more information! 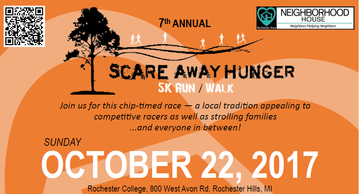 Our community members’ participation in our Scare Away Hunger 5K events over the last five years has played a crucial role in helping Neighborhood House provide food, clothing, emergency financial help, job coaching, budget counseling, short-term mental health counseling, transportation and self-sustainability programs to families in the Greater Rochester and Auburn Hills area. In 2016 alone, Neighborhood House helped 3000 families - that’s a significant impact!! We couldn’t have helped all of these neighbors without the support of our community partners. 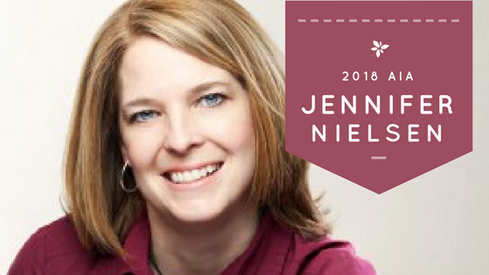 We are pleased to announce that this year's middle school author is New York Times bestselling author Jennifer Nielsen. In preparation for her visit, your student will be reading the book listed below for their Language Arts class. The book will be used for activities and discussion in the classroom, which will enhance the student experience. Please see the attached order forms for more details.